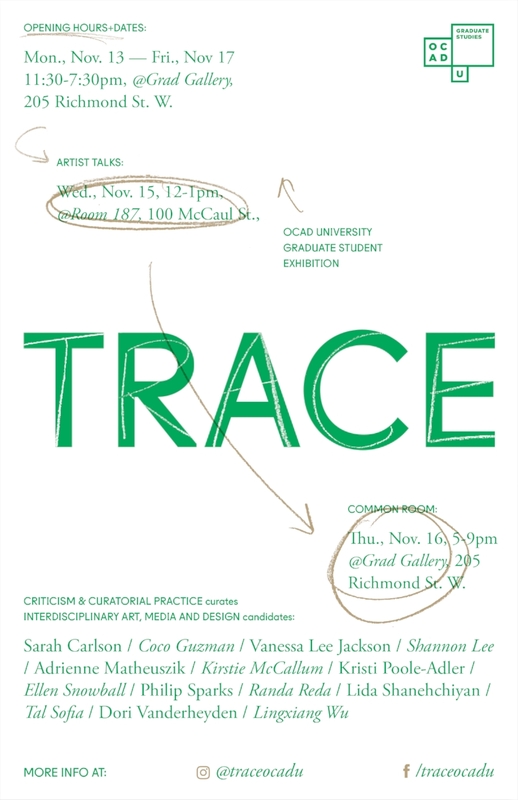 TRACE is happening at The OCAD Graduate Gallery (205 Richmond Street West). There is a reception on November 16 from 5-9pm with catered refreshments where you can meet, chat, and mingle with the curators and artists. We hope you can make it! Curated by the Criticism and Curatorial Practice first year program (including Jeff Tallon of Akin Sunrise), TRACE brings together the works of OCAD University’s Interdisciplinary Art, Media, and Design candidates to explore the contingent experience of presence as trace evades the ‘real,’ pointing to its constitutive outside: the unreal. Trace, a sign for everything elusive, has no site, but rather is change of site marked by its erasure, making it disappear in its appearance.